An outline drawing in ink of the top of the 'monk's stone' at Tynemouth in Northumberland (now in Tyne and Wear). 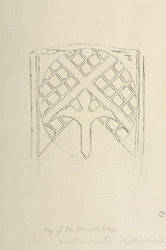 Formerly a cross, the shaft was all that remained by the time Grimm made this drawing. It was found on Monkhouse farm, and had been given a modern inscription by the Duke of Northumberland, who was lord of the manor and chief landowner.